Daily warm-ups, bell ringer activities, or Do Now activities help students smoothly transition into a classroom while also helping students review important editing and convention skills. 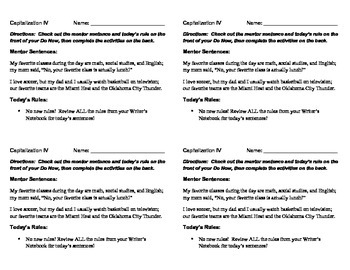 Students use this 4.25 inch by 5.5 inch activity to view a mentor sentence and editing and convention rule, then they flip it upside down to practice editing a sentence on their own. Finally, they write their own sentence! Make it a contest! 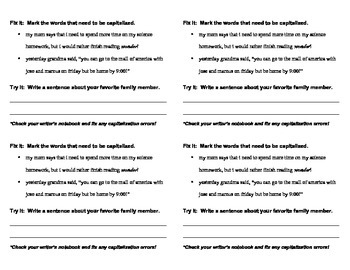 Have table groups compete to see if they can identify the correct number of errors in the "Fix It" sentences each day! 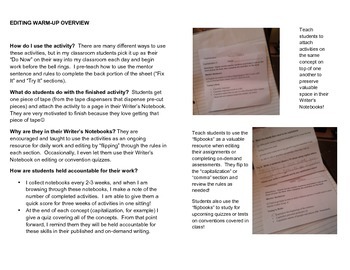 Students tape the activity into their Writer's Notebook to create an ongoing flipchart to use as a resource for writing or study guide for quizzes.